This page was last updated on 20 February 2018.
www.skye-self-catering.co.uk is maintained for your personal use. We welcome and encourage other websites to link to the information that is hosted on these pages, and you don’t have to ask permission to link to www.skye-eco-pod.co.uk. However, we don’t give you permission to suggest that your website is associated with, or endorsed by www.skye-self-catering.co.uk. The material featured onwww.skye-self-catering.co.uk is subject to copyright protection unless otherwise indicated. 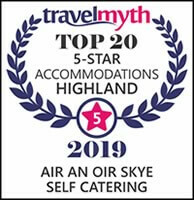 While we make every effort to keepwww.skye-self-catering.co.uk up to date, we don’t provide any guarantees, conditions or warranties as to the accuracy of the information on the site. In special cases, you can ask for content to be removed from www.skye-eco-pod.co.uk, eg if it breaches copyright laws, contains sensitive personal data or includes material that may be considered obscene or defamatory. Fill in the contact form, giving the nature of the content you’d like removed and why. We’ll acknowledge your request and let you know what’s going to happen. Unpublishing is at our discretion. This policy doesn’t affect your statutory rights to request information, including the Freedom of Information Act and the Data Protection Act. We may at any time revise these terms and conditions without notice. Please check these terms and conditions regularly, as continued use of the www.skye-self-catering.co.uk website after a change has been made is your acceptance of the change.